Born on this day in 1865, William Butler Yeats (1865-1939) is considered one of the best poets of the 20th century. A native of Dublin, Ireland, W.B. Yeats was one of the co-founders of what came to be known as the Tragic Generation. Comprised of a dozen London-based poets the poets of the Tragic Generation sought to create art that documented the mood of Victorian London. Also known as the Rhymers' Club the collective would publish two anthologies of poetry in quick order — first in 1892 and again two years later. A fervent Irish nationalist, Yeats also had a strong interest in mysticism — an interest that appears throughout his writings. In 1923 Yeats was awarded, "for his always inspired poetry, which in a highly artistic form gives expression to the spirit of a whole nation" the Nobel Prize in Literature. The recognition of the Nobel also brought Yeats finacial security for the first time in his writing career and some of his best works were produced after his win including The Tower in 1928. As memorialized in New York City, it is the first two verses of, When You Are Old that are enshrined on Library Walk. 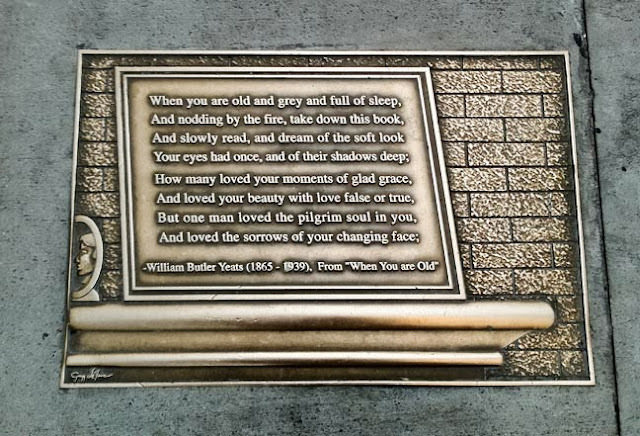 One of Yeats' earlier poems, When You Are Old was first was published in The Rose in 1893. In 1996, the New York Public Library, the Grand Central Partnership and the New Yorker Magazine convened a panel of esteemed lovers of the written word and came up with a collection of quotations from the never-ending oeuvre of literature. These quotes were cast in bronze by New York sculptor Gregg LeFevre and then laid out as sidewalk plaques on E 41st Street in 1998. In 2003, the stretch of E 41st Street from the New York Public Library entrance on Fifth Avenue to Park Avenue was renamed Library Way. Whether it be a birth day, anniversary or publication date of a seminal work, the Bar None Group will revisit these 40+ quotations from time to time — quotations that inspire one to write, read, explore and embrace literature. We last visited fellow Nobel laureate Samuel Beckett.